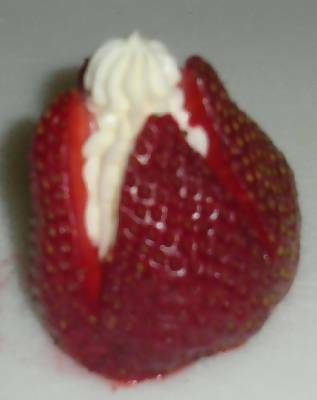 I absolutely love these stuffed strawberries! I love how light and refreshing they are. The taste reminds me a lot of strawberry cheesecake... except these are portion sized and lower in calories! 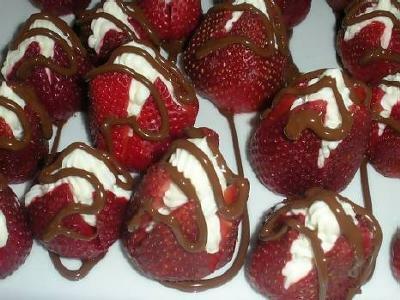 I make them as soon as the strawberries start to come into season and they are always a great hit at parties. You will also need pastry bag with a large star tip. Wash strawberries and pat dry. 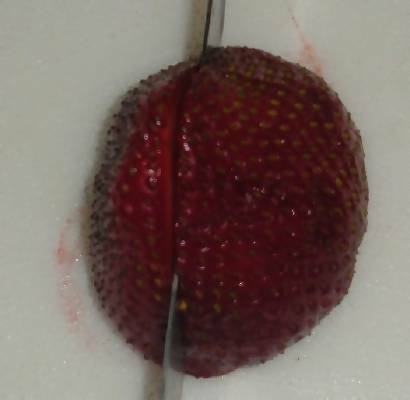 Cut stem and base of each strawberry to make a flat surface on the bottom. This will help them to stand up easily. 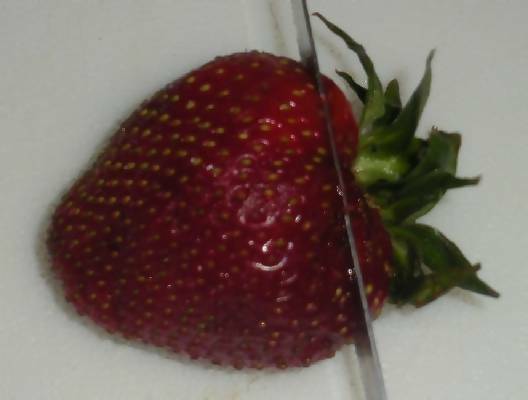 Stand strawberry upright and cut a criss-cross or x on the top of the strawberry, going 3/4 deep. This allows for the strawberry to open up when you add the filling. Spoon mixture into the pastry bag. 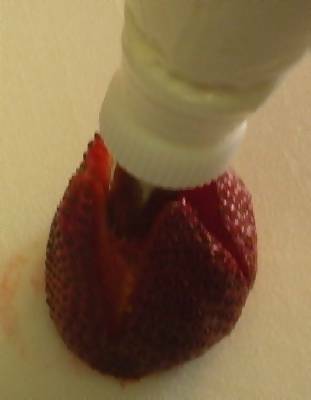 Open the strawberry and push the star tip down into it. 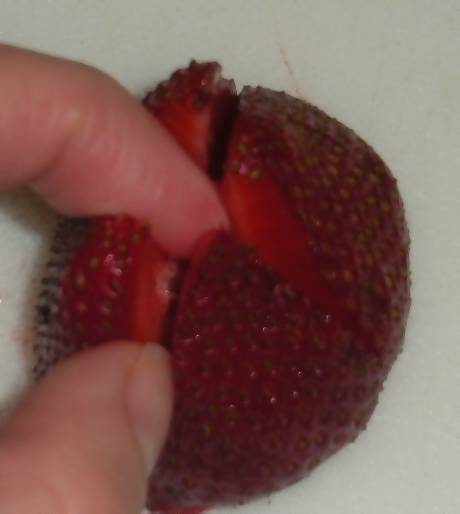 Fill the strawberry with mixture. 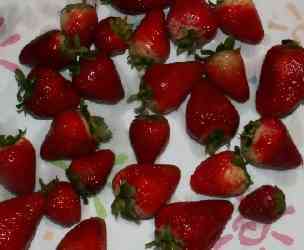 Repeat process with each strawberry until all strawberries have been filled. Arrange strawberries on a platter to serve. You can drizzle the platter with chocolate for a nice effect. Chocolate, cheesecake and strawberries...you can't go wrong with this combination! Doesn't it just look divine?! Best of luck with your baby shower! Try dipping the strawberries in chocolate first then cut the tops off in cut the center out and then pipe the stuffing and sprinkle graham cracker crumbs on top. You will not want to eat them any other way! 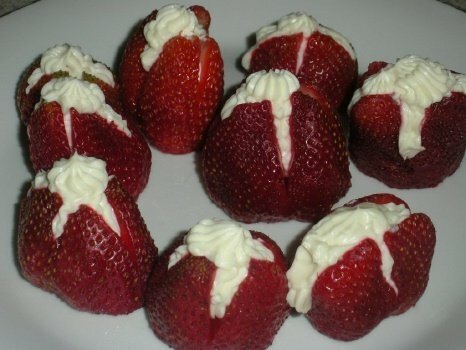 These stuffed strawberries are amazingly delicious! I made them for my sister-in-law's baby shower. 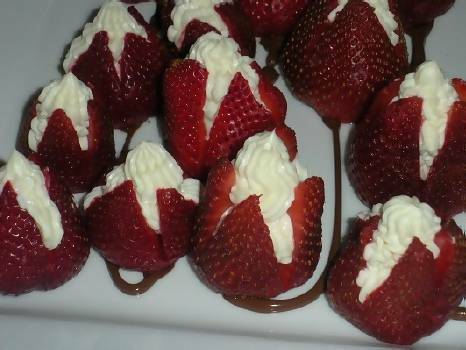 The strawberries were a little out of season but the cream cheese filling and chocolate well made up for that. Soooo good...will definitely add to my favorite recipes box. Thanks!